I would much rather talk to my friends and family throughout the year rather than stuff it all into one crazy month of; parties, lunches and random catch ups. I know we’re all busy and stuff as the days move from January to February and from February to November (at least that’s how it feels) but the concept of the holiday season leaves me scratching my bald spot. When a post goes viral. As a writer, or a blogger, you hope your work will resonate with an audience. Whether it’s an audience of family and friends, or maybe a stranger or two, you hope what you say will have meaning. Particularly when you write for the love of it and make no income from it. Particularly when you write from the heart. A harsh, but necessary, truth. The truth of the matter is, no matter how hard you try, you cannot have it all. There it is. Harsh, perhaps, but honest. Christmas Wrapped Propaganda is Unacceptable. Yesterday, as reported in various media outlets, a member of the Marriage Alliance gave a School bus driver ‘gifts’ for each of the children who boarded his bus. The bus driver handed the wrapped gifts to each child who boarded the bus, as he was asked to do. When the children got home and showed their parents the gifts, they were anti-safe school propaganda. Regardless of what you think about the necessity of Safe Schools, or whether it’s appropriate, the behaviour of the Marriage Alliance is not acceptable. Take a moment to reverse this. Change the scenario. If the Gay and Lesbian Rights Lobby were responsible for providing Christmas wrapped Pro Safe School pamphlets to young children, all hell would be currently breaking loose. Groups like the Marriage Alliance feel it is their God-given right to have their voices heard. And that’s fine. It is their right, under Australian law, to be free to make their voices and opinions heard. It is not acceptable – nor their right – to approach a school bus and distribute propaganda any more than it is the right of the Gay and Lesbian Rights Lobby to do they same thing. The Anti-Safe Schools, Anti-LGBT Rights groups bare no responsibility for the damage they are causing. They act with impunity in Australia, poisoning the conversations around LGBT rights, around creating safe schools where students who are LGBT are not the victims of daily torture and torment from their peers. They inflame the hatred through their deliberate muddying of the conversation, invoking hate as a national discourse. 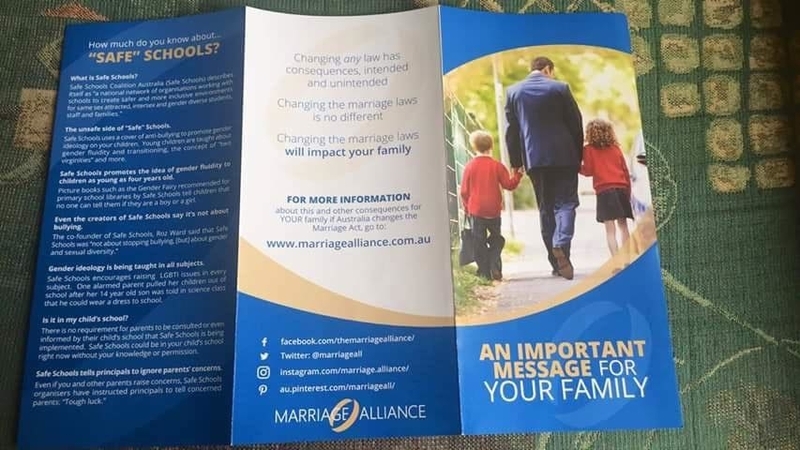 While children who are questioning their sexualities are being bullied into their graves in this country, people like the Marriage Alliance are free to peddle their propaganda to school children, while invoking the “won’t somebody think of the children” mantra of the truly uneducated. The school that was targeted is one that caters to students throughout their education career. From Kindergarten to Year 12. Students on the bus that was targeted range in age and could well be like the most recent victim of homophobic bullying, Tyrone Unsworth, who took his life less than a month ago, after years of constant bullying. To organisations like The Marriage Alliance, children like Tyrone are collateral damage in a war. They don’t count. Their deaths do not matter. Tyrone was 13 when he committed suicide. At the time of his death there was much written about the abuse and bullying he suffered. After his death his parents and friends are still being trolled on a social media page set up in remembrance of a boy who died too young. Yesterday, on the school ride home, there was a Tyrone. Statistically, there had to be. A teenager, being bullied, questioning himself and fearful of tomorrow who was handed a piece of propaganda about the gay agenda. A young person who got home, opened the package, and realised they had brought the bullying in the front door with them. If those who disagree with the Safe Schools program were serious about doing something, they would sit down with those in favour of it and create a mutually beneficial program. One that took all into consideration and taught acceptance and support. But that doesn’t play into their agenda. I hear a lot, we all do, about the Gay Agenda. About the need to convert kids to the ‘gay lifestyle.’ Both of those sentiments make me sick to my stomach. Trust me when I tell you the LGBT community don’t need to ‘convert’ your kids. We are not made by external forces. We are not weak-willed individuals who are easily manipulated to go against the ‘normal’. LGBT people are some of the strongest people I know. We’ve fought our way out of hell. We were raised in a world that told us were freaks, that told us we were wrong, weak. We have fought more battles in our own minds than people like The Marriage Alliance can even contemplate. For some of us; we lost everything. Families, friends, self esteem and confidence. For others, we look at the acceptance of our families and friends and we hear how ‘lucky’ we are not to have been thrown away by those who gave us life. There is no ‘Gay Lifestyle’ to choose, because choice has nothing to do with it. Was it really a choice for you? Was it something you went to bed and cried yourself to sleep over? Was it something you fought against, prayed for death, begged to change only to realise you couldn’t chance a thing? Was choosing to be heterosexual something you ever gave a thought to or was it just the way you were? The miseducation of the fearful, that sexuality can be ‘converted’ is ridiculous. You can not convert anyone into being Gay, or Lesbian, or Bisexual, or Transgender any more than you can convince someone to change the colour of their eyes, or the colour of their skin. But working together, for equality, isn’t in the remit of groups that invoke ‘God’ as a mask for hate. Groups that use words like ‘traditional’ to prevent equality. Groups like The Marriage Alliance do not want equality, they want the war. They want the ‘they’re coming to steal your children in the night’, because without the war, they have no purpose, no meaning. Whether you’re pro safe school or against it, that’s fine. It’s your right as an adult to make the choices you make in the raising of your children. If you don’t agree with teaching your child that everyone is important, that everyone has the right to be equal, that no one should be judged because of their sexuality, their religion or the colour of their skin, then that is your right. But we should all be able to agree that children coming home from school on a bus should not have propaganda of any sort given to them by a stranger. Going into a school, handing out christmas-wrapped propaganda is unacceptable. If you can’t argue your message clearly without resorting to these sort of tactics you’re already losing. Leave the kids, and the holidays, alone. When it comes to election season, no matter where you are in the world, it’s hard to believe your vote will count. There are so many people turning up at the polls, so many people all over the country, that it’s easy to think your vote doesn’t matter. In Australia we have compulsory voting. Everyone over the age of 18 is legally obligated to vote. There’s a fine if you don’t. In other countries, like America, voting is an option. If you don’t want to vote, you don’t have to. I admit that goes against everything I’ve been brought up to believe in. Sure there have been times when I looked at the available options and wished I could stay home or vote for Kodos, but regardless of the political system you live under, it usually comes down to voting for the least objectionable choice. In Australia we vote under the Westminster System which basically means we vote for a local member. The party with the most votes, wins. Since 2010 the waters surrounding how we vote have been muddied. The rolling of a sitting Prime Minister, and the Amercianisation of the electoral system by then opposition leader, Tony Abbott helped to distort the discussion about who we actually voted for. The Party Leader or the Party. In American the Presidential election is much simpler, although infinitely more complicated for an outsider looking in. Two Presidential candidates, plus a Green and an Independent run around the country for about 100 years campaigning to be Commander-in-Chief. There’s lots of rallies and handshaking, the occasional baby kissed for the world’s media. There also appears to be huge levels of mud slung with abandon, and celebrity endorsements. For all that it’s a political election, it has the feel of a Barnum & Bailey “Greatest Show on Earth” type vibe. It’s also exhausting. I don’t honestly know how the American people put up with it. The most recent Australian election was the longest in memory at about 8 weeks. It was enough to wear out most Australia’s patience. A year long campaign wouldn’t cut it in Australia. The nation would zone out and God only knows what we’d end up with. But back to the point, your vote does count. Whether you believe it or not the democratic right to have your say is important. To give you an example of just why a vote matters, I turn to the Australian Senate. There’s never been a more exciting time to be an Australian Senator. In May 2016, after failing on multiple occasions to pass a particular piece of legislation, Prime Minister Malcolm Turnbull pulled out his “get out of jail free card.” Granted he waited until he’d done a deal with the Australian Greens to pass the Senate Reform Bill, but the PM called a Double Dissolution election. This means he dissolved both Houses of Parliament and sent Australia to the polls early. The main scope of this was to clear the Senate of the cross-bench of independent Senators and maybe, if he was lucky, get some new Liberal and National Senators in there to make life easier. The gamble, which the media said was a brilliant strategic move at the time, turned out to be a bit of a disaster. Despite the media coverage telling us that the Opposition Leader was going to lose horribly, it turned out that the people chose to exercise their votes. This was probably not expected given Australia’s overall reluctance to have a 1-term Government. The Prime Minister lost his overwhelming majority in the House of Representatives, going from one the biggest majorities in Australian history to a majority of just 1 seat. The Senate, the main reason Turnbull had thrown the Double Dissolution to the people in the first place turned into a bigger mess than before. And the reason for this? In a nutshell the election reduced the number needed to obtain a seat. A political fringe-party, Pauline Hanson’s One Nation, managed to go from 0 seats to 4. The party already seems on the verge of imploding as the power that comes with the being wined and dined by the Government comes to a head. Any other election he would have, hopefully, struggled to get a seat but with this election he did. Yesterday he had a Major Policy Announcement, that turned out to be a 43 page report debunking climate change. For the amount of time he spent studying why climate change is wrong – by the way, the world is actually cooling down, not heating up according to his press conference – I would have assumed he’d be able to write more than 43 pages. I haven’t seen the report but I want to get my hands on it. There’s a man in the Australian Senate, speaking for just 77 people. His vote effects the lives of 22+ million people. The Party has already voted to hit the unemployed with a social services cut and to support a $50 billion tax cut for some of Australia’s richest companies. The Party has said they’ll vote for the ABCC (the trigger for the Double Dissolution) when it next comes to the Senate. Last night they voted for the Marriage Equality Plebiscite, a $200 million public opinion poll that would have handed tens of millions of dollars to both the Yes and No campaign to explain why Marriage Equality was the right of every Australian to have a say in. Trump has carried on about the election being rigged if he doesn’t win, which leaves his followers so convinced their votes will be discarded that one woman has already been arrested for voting twice. When asked why, she explained to the media that Trump had warned them their votes would be destroyed so she thought she’d do it again, just to make sure her vote counted. Optional or compulsory, your vote is your voice. Use it.